I can picture the first time I was served Fruit Pizza; the colors and decorative nature of the whole thing was beautiful...it reminded me of a kaleidoscope design. 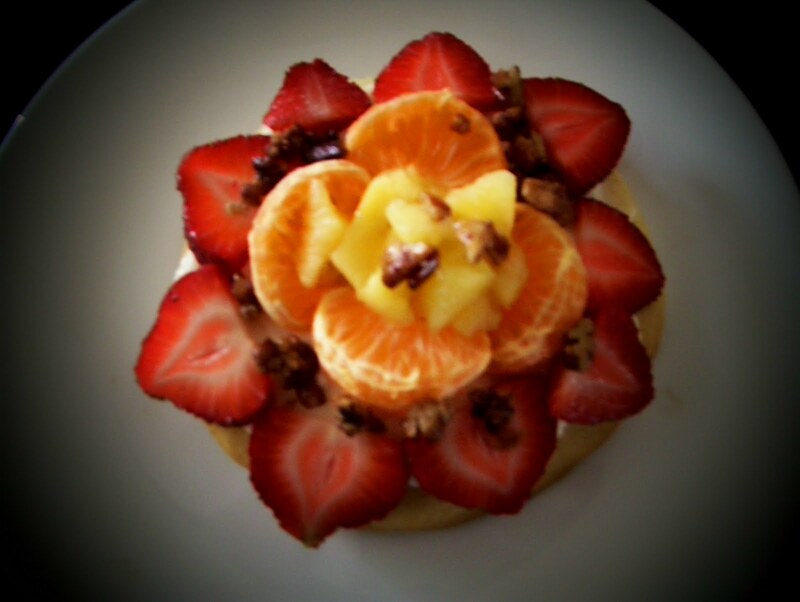 As much as I loved that fruit pizza, I have to confess, I never made one until recently. Most recipes use commercial sugar cookie dough for the base. While this is an easy way out, I think that type of dough has a fake flavor. Today's post version uses an easy sugar cookie recipe which was used to make the base for a smaller version of the pizza...I made little fruit flowers with the most delightful orange-flavored cookie crust...perfect for two people. 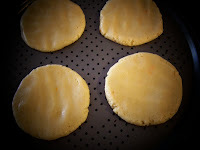 The second layer is a light, rum-flavored, sweetened cream cheese...it is so wonderful combined with the orange flavor in the cookie and the fruit. Last, I added sugared, cinnamon pecan pieces, that give a delightful crunch and richness to the whole dessert. (I did use the fresh fruit I had on hand to create this dessert flower, but almost any combination of fruit that can sit on a coated cookie would work well. Just remember to start layering from the outside in). Note: Future post #53 will feature a true fruit pizza with a wonderful, crisp crust and a glazed topping. Cream shortening and sugar; beat in egg until fluffy. Add melted margarine, vanilla, and orange peel. Beat until well blended. Measure and mix flour, soda, cream of tartar and salt. Add this to creamed mixture. Chill several hours. * (Dough will be oily). Divide dough into thirds. Form teaspoon-sized balls and place them on baking sheet. Flatten to about 1/4 inch thick with the bottom of a glass dipped in decorative sugar. Bake 10 minutes. Let rest on sheet 2-3 minutes after removing from oven. Transfer to wire rack. makes 3 1/2 dozen. May be doubled. *Divide refrigerated cookie dough into thirds. Remove one third and roll 1 1/2 inch balls of dough. (One large cookie is for (2) servings). Roll enough for your needs. Save remaining dough for sugar cookies. Press dough into three-inch circles and place on cookie sheet*. Bake 350 degrees for 12 minutes or until browned. Remove to a rack and cool completely. *(Don't use the pizza type pan as shown...the dough presses through the holes). For each cookie, mix 2 T cream cheese with 2 T powdered sugar, blend well. Add 1-2 tsp rum flavoring and mix in thoroughly. Spread cooled cookie with cream cheese. Slice stem end off of two large strawberries and stand strawberries on flat side. Slice each thinly and decorate the outer edge of cookie with slices. Peel a clementine and place 4 segments around the inner circle of the strawberries. Fill the center with chopped, fresh pineapple. Cover and refrigerate. Just before serving, sprinkle coated nuts over fruit flower. Serves 2. Note: Other fresh fruit may be used...blueberries, raspberries, peaches, bananas. In a skillet, melt margarine over med-lo heat; add sugar and nuts. Cook for 3 1/2 minutes, stirring constantly. Lightly sprinkle nut mixture with cinnamon. Mix and stir for 1/2 minute more. Remove to a piece of lightly greased aluminum foil until cool. (These nuts are wonderful for many dessert and breakfast recipes. Make a larger batch and store in an airtight container for later use). Kenda wrote: This is beautiful! And it looks delicious!